Mushy pea curry and Smash pizza are new recipes for me so wish me luck! I'm going for a roast at my parents this week, so will take my own roast potatoes and will just have to be careful out for lunch at Wagamama's. Will need plenty of willpower and no dramas this week but will give it my best shot. 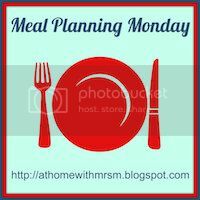 I'm linking with Mrs M, so check out the other menus on the links.